In Estonia, the collection of birch sap begins in early spring, usually at the end of March or beginning of April. The key is that the medium temperature over 24 hours has to reach about +4 C°, before the sap starts to run. The length of the harvesting period is about 14-21 days. Maple sap, on the other hand, starts to run earlier, as soon as the daytime temperatures reach above zero, even if the nights are still frosty. The maple species represented in Estonia is Norway maple (rather than sugar maple like in North America) which does not yield much sap. Thus maple sap is used in private consumption, but has not been taken up in commercial production. We harvest birch sap with the help of modern technology that does not damage the trees or their environment. To collect the sap, we drill an eight mm perimeter hole in the birch stem and insert there a small plastic spout. We use spouts produced by Leader Evaporator Inc., the largest enterprise in the USA that produces equipment for collecting and processing maple and birch sap. Kasekunst is the official representative of Leader Evaporator. In Europe, any of their products can be acquired through us with their catalogue prices. When collecting birch sap, one has to be very careful, as it perishes very easily, within 48 hours on average. 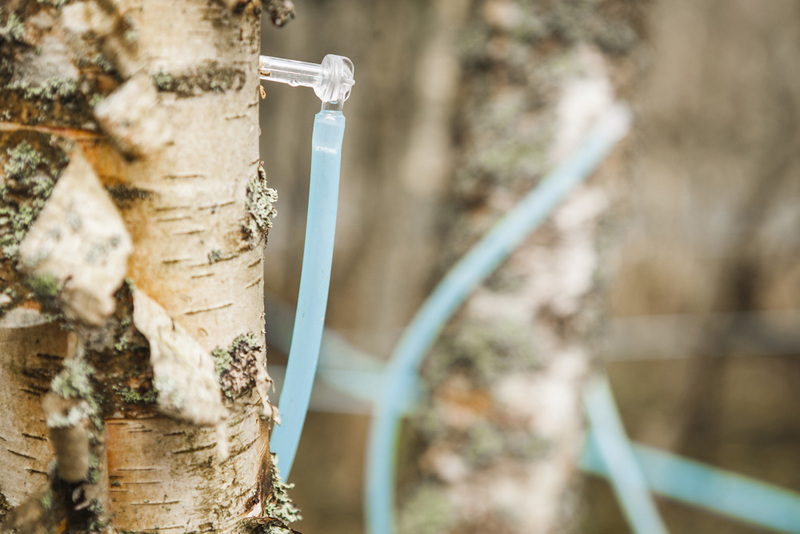 2016 we introduced in Estonia the method of collecting birch sap via a closed tubing system, used in Northern America. All the trees are joined into one system and, with the help of the vaccuum pump, the sap flows into one large collection tank. This method of collection is very efficient and also the best in terms of avoiding the contamination of the sap. The birch sap contains a spectrum of different minerals, being especially rich in calcium and potassium; it is also a true powerhouse of vitamin C and other antioxidants. With the average sugar content of 1 per cent, the sap has a cool refreshing taste with a slight sweetish undertone. It is drunk in early springtime as an exhilarating and detoxifying tonic that energises one after a long winter. It is also a very special drink for the reason that one can enjoy it for only two to three weeks a year.